Raisins are nutritious, keep well and have been a coveted trade good since Antiquity. The Armenians grew the first seedless grapes, in order to dry them as raisins. As these were reserved for the mighty sultans, the berries became known as sultanas. The term “raisin” is derived from the Latin racemus, which translates as grape. 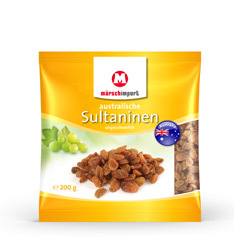 The berries of the seedless sultana grape are mainly cultivated in Turkey and Greece. Australia, South Africa and California are all significant exporters of raisins. The cultivation and particularly the harvest of sultanas are at the full mercy of the weather; periods of rain during the drying phase are increasingly having a major impact, reducing harvests. 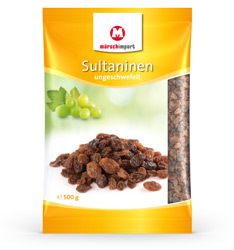 15 kg of fresh grapes are used to produce 1 kg of dried sultanas. The production of sultanas remains a labour-intensive process to this day. Thanks to their fruity flavour and energy values, sultanas have become an essential ingredient in recipes for baked goods and desserts. Their glucose also provides energy for sport and leisure.